We are continuing our Arrive & Drive program this year with some great events. We will again be providing A&D for the Wolf GB08 and the BMW M3 for both race and HPDE events. We will be supporting events at COTA, other Texas tracks, and are always available to support track events outside of Texas. All WRL races are on our schedule with seats currently open. As many of you have experienced our A&D program is a no hassle approach that includes everything you need for a fun and successful weekend. From tires to fuel to support to basic coaching we deliver the complete package. 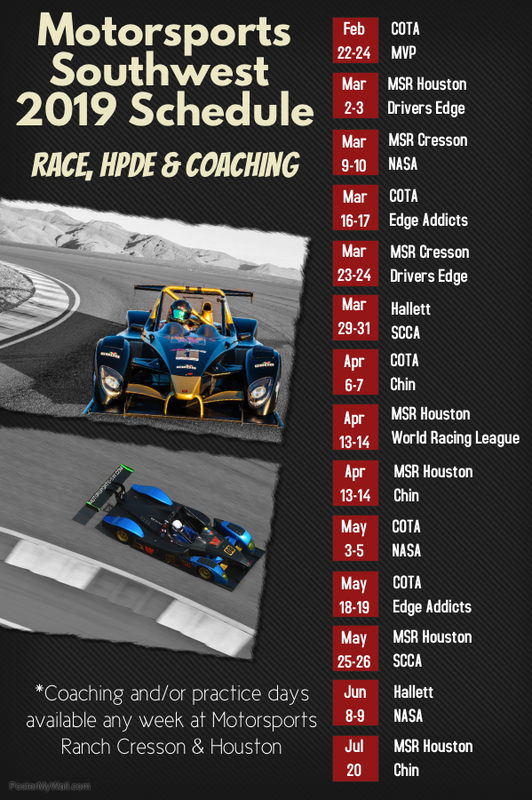 If you want to experience driving a high downforce LMP car, race WRL, NASA, or SCCA or experience COTA as a bucket list item, give us a call or email to get signed up for 2019!